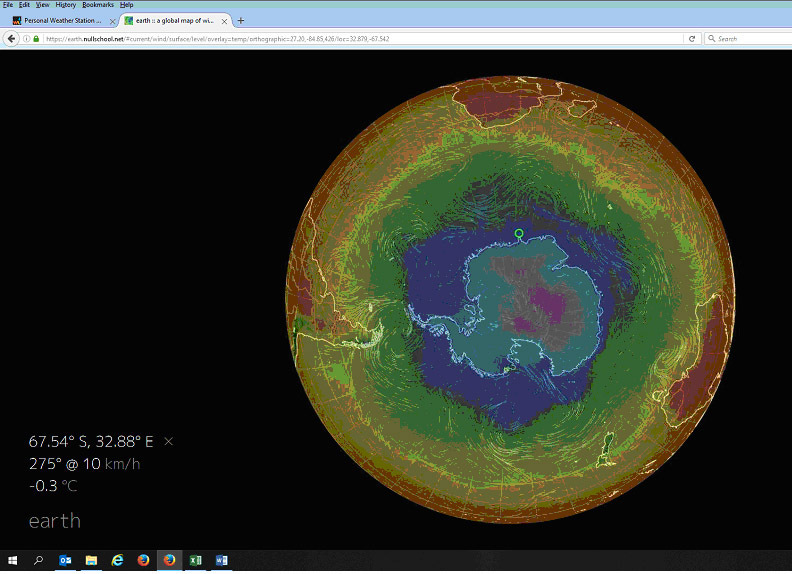 and the temp display showed a near perfect one over the South pole! <<Saturn's hexagon is a persisting hexagonal cloud pattern around the north pole of Saturn, located at about 78°N. The hexagon may be a bit greater than 29,000 km wide, may be 300 km high, and may be a jet stream made of atmospheric gases moving at 320 km/h. It rotates with a period of 10h 39m 24s, the same period as Saturn's radio emissions from its interior. The hexagon does not shift in longitude like other clouds in the visible atmosphere. Saturn's hexagon was discovered during the Voyager mission in 1981 and was later revisited by Cassini-Huygens in 2006. During the Cassini mission, the hexagon changed from a mostly blue color to more of a golden color. Saturn's south pole does not have a hexagon, according to Hubble observations; however, it does have a vortex, and there is also a vortex inside the northern hexagon. Multiple hypotheses for the hexagonal cloud pattern have been developed. One hypothesis, developed at Oxford University, is that the hexagon forms where there is a steep latitudinal gradient in the speed of the atmospheric winds in Saturn's atmosphere. Similar regular shapes were created in the laboratory when a circular tank of liquid was rotated at different speeds at its centre and periphery. The most common shape was six sided, but shapes with three to eight sides were also produced. The shapes form in an area of turbulent flow between the two different rotating fluid bodies with dissimilar speeds. A number of stable vortices of similar size form on the slower (south) side of the fluid boundary and these interact with each other to space themselves out evenly around the perimeter. The presence of the vortices influences the boundary to move northward where each is present and this gives rise to the polygon effect. Polygons do not form at wind boundaries unless the speed differential and viscosity parameters are within certain margins and so are not present at other likely places, such as Saturn's south pole or the poles of Jupiter.